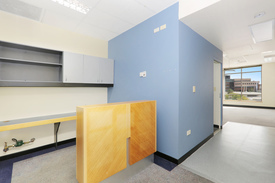 9 Commercial Real Estate & Properties in Kogarah are listed in 5 categories. We have 5 OfficesSale , 2 Retail ShopsSale , 1 ShowroomsSale , 1 Development LandsSale and 1 Industrial Warehouses Sale . CPG are pleased to present for sale this 202m² ground floor showroom/office space on the Princes Highway, expose your business to tens of thousands of cars daily! Situated opposite where President Avenue meets Princes Highway and St George TAFE, this property is in prime position for any owner occupier looking to generate the maximum amount of exposure for their business, while also being only 650m from Kogarah train station, or the astute investor looking to secure a solid potential rental return. Other features include: 7 secure basement car spaces 11 visitor car spaces for clients and customers Additional 45m² undercover outdoor area Open plan layout ready for your dream fitout Rear lane and disabled access Moments to Kogarah train Station, public transport & St George Private hospital Great natural Light with a full glass facade Air conditioned Multiple entries and bi fold doors For further information or to arrange your inspection please contact Ryan McMahon 0429 228 460 or Carl Pearce 0477 880 576. Close to major arterial roads 1,232m² warehouse & ground floor office 55m² first floor offices Freestanding building Male & female amenities Ample on site parking Ducted air conditioning throughout the warehouse 3 phase power Container access Approx Contact Damen Astey on 0431 817 616 for more information or to arrange an inspection today! Strategically Located on the busy Princes Highway and adjacent to President Avenue is this brand new retail or office suite. Developers will consider renovating the suite, providing for split system air conditioning, celings and polished tiles. Now featuring: Approx. shop area 94m2, total area approx. 128m2 2 secured car spaces + storage room Glass shopfront High ceilings Common bathroom and amp; kitchenette amenities Rear loading dock Just opposite St George Tafe and amp; James Cook Boys High School. A short stroll to St George Hospital and nearby public transport. Be quick and seize this opportunity now!